Pakistan and India, these neighbors got Independence in the mid August 1947. Today 55 years after the Independence where do these two major countries of the subcontinent stand vis a vis their religious minorities, is the question which we need to answer to ensure a better and more democratic area. 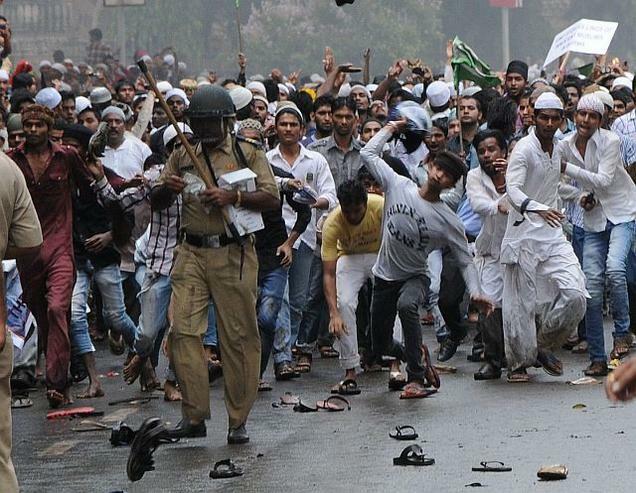 On August 11, 2012, a mob of over 50000, mainly Muslims, assembled in Azad Maidan to protest against the ill treatment of Muslims in Assam and Myanmar. After some speeches full of provocation and after display of some provocative posters, the mob turned violent and vented its ire against the media for not covering the plight of Assam’s Muslims displaced in the July violence involving Bodos and Muslims. Needless to say that in Assam violence nearly 80 people have been killed and over 4 lakh people, mostly Muslims-Bodos, have been displaced, right under the nose of the ruling government. It burned few OB vans. Mob also took on the police. Humiliated-molested women police personnel and beat up other police personnel. While controlling the violence the police did the firing, which lead to death of two young men. In the whole scuffle many a police personnel also got injured. Now, the Raza Academy, the organizers, has issued an apology saying the meeting was infiltrated by provocateurs. Still the organizers cannot shun their responsibility from the whole tragedy. The protest has always to be on democratic lines, non violent and the speeches in meetings have to be on moderate lines, the hate speech and inciting the mobs is not excusable on any condition. In the same week there is news that nearly 300 Hindus have crossed over to India from Pakistan. Ostensibly they have come here for pilgrimage, but many of them have stated that they will not go back as they don’t feel safe in Pakistan. Most of these Hindus are from Sind and Baluchistan. There are reports of forced abduction and conversion of Hindu girls there and the religious minorities have to live the life of second class citizens. The religious minorities persecuted in Pakistan are not just Hindus; Sikhs and Christians but also Shias and Ahmadiyas, a sect of Islam. Where do we find ourselves nearly six decades down the line after we committed ourselves to democracy and secular principles? India came into being as a secular democratic state and even Pakistan which was formed in the name of Islam for the Muslim majority areas of British India began with the secular principles as enunciated in the oft quoted 11th August 1947 speech of Qaed-e-Azam Jinnah. In the speech he said that the state has nothing to do with the religion, people are free to go to their mosques, temples and churches or whatever, as it is their personal matter. He also said that the white color in Pakistan flag represents minorities. Still the logic of communalism was ‘built-in’ in the whole system. One can make a secular speech but the social base which had resulted in formation of Pakistan, the one of feudal elements was intact. Mere secular speeches don’t change the social reality. The communalism caught up in Pakistan in due course of time and in late seventies, with Zia ul Haq-Maulana Maududi duo ruling the roost, the Mullahs came to the fore-front. The Mullah-Military complex backed up by the United States, which had a substantial say in the affairs of Pakistan, violated every letter and the core spirit of the speech of Mr. Jinnah, to the extent that today even the Muslim minorities, Shias and Ahmadiays are as much victims of religious intolerance and it is getting reflected in their political status in the country. India with Gandhi and Nehru as the major pillars of shaping the values of Indian national movement, were unshakable in their commitment to secularism. Gandhi, the devout Hindu and Nehru the atheist had the vision of a state totally committed to respecting the people of all religious denominations, while keeping a distance from those trying to bring in matters related to faith in the ambit of the policies of state. Nehru while doing this realized two major handicaps. One that, while our constitution is secular, the society is in the grip of religiosity, so he found this as an obstacle in full implementation of secular policies. The second flaw he saw was that in his party, which was founded on the grounds of secular values has been infiltrated by communal elements. There was no one to heed to his warning, and in due course many an actions of some Congress leaders were indistinguishable from those of the communal elements, those forcing the country in the direction of religious nationalism. The health of democracy in any country has to be gauzed by the security and equity of minorities in the country. Through the complicated mechanisms, the influence of communal elements has risen exponentially during last three decades in particular. The whole trajectory of these two countries has been very different. While in Pakistan, there was always a space for communalism to creep in comfortably, task of communal politics became still simpler with the country falling in to the grip of Military dictatorships time and over again. The intervention of United States and US policies in Afghanistan, in particular, added fuel to the fire. In India, the opportunism, the fallacies of electoral system, first past the poll, the rising anxiety of sections of society, the successful effort of communal forces to project the fear of the small minorities to the big majority and the politics around emotive issues like Ram Temple completed the picture. Today roughly while Muslims are 13.4% in population, their percentage amongst violence victims is 90%. Today they are standing at the bottom of socio-economic indices. Sachar Committee has demonstrated it beyond any shadow of doubt. In Pakistan, the percentage of Hindu minorities has declined over a period of time and their security and social status is abominable. The injustices on minorities in one country are no justification for heaping of injustices in other country. The reactionary communalism is used by political forces in their own ways. The communal forces in India look at the Hindus exiling from Pakistan and the Assam violence as the attack on Hindus. In Pakistan the atrocities on Muslims in India give them a handle to further intimidate the Hindus there. In response to Babri demolition, many a temples were razed to dust in Pakistan. All said and done there is a gross contrast between the situation in Pakistan and India. Despite setbacks, the secular democratic values are the foundation of Indian system, though very much compromised in recent decades. In Pakistan on the other hand, democracy has been a marginal value, there are efforts to root it in Pakistan but the obstacles are immense. The common factor is the suffering of minorities though the degree of this suffering is very different in both these countries. Where will all this lead us to? The communal issue is a big brake to the social development of the countries as a whole. The values of affirmative action for weaker sections of society, the going an extra mile to protect them and to bring them up in social area is what is needed. Sixty five years after coming out from the yoke of colonialism, it is time we remember the values of Liberty, Equality and Fraternity, the principles which guided our freedom movement. In India there is an urgent need to reform our electoral system to reflect our social and political needs. Communal violence and discrimination against minorities is an immense loss to our national ethos and humanism. Time to check it and reaffirm in practice, those values which made us India! And for Pakistan high time to come back to the values outlined in the speech of Jinnah on 11th August 1947, decline in the percentage of inorities and their exodus from Pakistan is a great insult to the founder of Pakistan!